In an effort to give her newly adopted teenage son, Ethan, a fresh start, Philadelphia journalist Madison Wade relocates to a small Tennessee town. When Ethan goes on a camping trip with three other teens and returns without their chaperone, Ethan’past casts him as suspect in a crime. The secrets Madison uncovers as she tries to clear her son brings danger from unexpected places and puts her at odds with the local sheriff — a man who has been trying to win her heart. 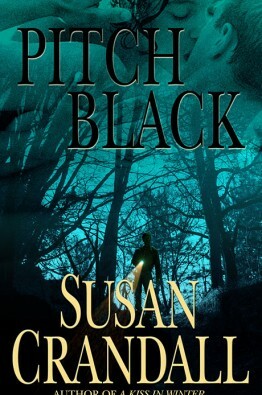 For your reading pleasure, I’m thrilled to announce the arrival of my first romantic suspense, PITCH BLACK. In this book I’ve combined the best of what I’ve done in women’s fiction with the best of what I love about romantic suspense. The story is about the characters, and yet the plot will keep you turning those pages. It has some truly frightening moments, which I found delicious to write. In a nutshell, as they say, PITCH BLACK is the story of a single Philadelphia journalist, Madison Wade, who adopts Ethan, a thirteen-year-old boy she met while doing a story on children of the streets. In an effort to give him a clean start and distance him from the pitfalls of his old life, she takes a job in a small Tennessee town as editor of the local daily paper. Just when it appears things are going well, Madison is beginning a relationship with the sheriff, Gabe Wyatt and Ethan is building his first friendship, trouble arrives in a way Madison could never have predicted. Ethan and three other teens go on a wilderness camping trip that ends in a nightmare. The fallout of this event will endanger not only Ethan, but Madison as well.